Using a cron-based schedule to trigger the build of a plan is one of the available methods for triggering builds in Bamboo. This schedule is configured using the Schedule Editor. 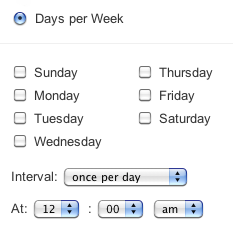 The schedule can be daily (times per day), weekly (days per week), monthly (days per month) or based on a cron expression. Locate the plan in the list and click the edit icon ( ) to display the plan's configuration pages. Choose Trigger type > Cron Based Scheduling. Click the edit icon ( ) next to the current schedule to display the Schedule Editor. Use the Schedule Editor (see screenshots below), to specify the build schedule for your plan. For information about cron expressions, see this FAQ: Constructing a cron expression in Bamboo.